Mozambique is highly vulnerable to natural disasters, in particular those of hydro-meteorological origin such as floods, drought and cyclones. Increases in both temperature and average precipitation due to climate change will exacerbate the already high incidence of extreme events in Mozambique. This will contribute to the uninterrupted sequence of drought and floods that Mozambique has suffered. Since 1970, Mozambique has been hit by 34 cyclones or tropical depressions and five major flood events (in 2000, 2001, 2007, 2008 and most recently in early 2012 following tropical cyclones from the Indian Ocean coast). These events have had dramatic social and economic consequences. For example, in 2000 the most devastating floods in the history of Mozambique killed 700 people, with damages estimated at US$600 million. In the capital city of Maputo, the main hazards associated with climate change are likely to be temperature increases, extreme events related to precipitation and sea level rise. The rising sea level has already resulted in saline intrusion, which affects urban land and infrastructure. There are already noticeable coastal erosion problems, but further sea level rise will increase the risk of flooding in the lowest lying areas. The potential impacts of extreme events in Maputo are likely to be associated with the deterioration of the already precarious infrastructure system, food insecurity and an increase in vector-borne diseases. The impacts of climate change in the city of Maputo need to be understood in the context of vulnerability. Approximately 54% of Maputo City’s residents live below the poverty line of US$1.50 per day, and 70% live in informal settlements and areas of dense unregulated growth that lack basic infrastructure and services such as water, sanitation, drainage and electricity. Government authorities and expert assessments link flood vulnerability to a proliferation of unplanned human settlements during the last three decades; these areas have gradually expanded to low-lying and marshy areas characterised as having high flood risk. More than 60% of the population has limited access to services such as energy, cooking fuel and sanitation. Thus, access to services and infrastructure constitutes one of the main aspects of urban deprivation in Maputo. The capacity of the city to respond to extreme events related to climate change is limited by existing urban conditions. Not only are the impacts more severe in deprived areas, but also the residents in such areas may have fewer resources to cope with the aftermath of these disasters. Moreover, the focus on developing formal strategies for land planning may clash with informal strategies to access land and resources adopted by residents in deprived areas. The urgency of the climate change challenge may lead to policies that overlook the complexity of arrangements whereby these citizens not only survive but also contribute to and maintain the city. The project ‘Public, Private, People Partnerships for Climate Compatible Development’ (4PCCD) in Maputo, Mozambique, developed participatory planning methods to foster partnerships between actors within different sectors in order to tackle climate change through actions in specific locations in Maputo. The objective was the creation of partnerships that could integrate climate change concerns fully, while at the same time addressing directly the concerns of local residents. This background paper provides an overview of the case of Maputo, specifically the neighbourhood of Chamanculo C in which the project took place. 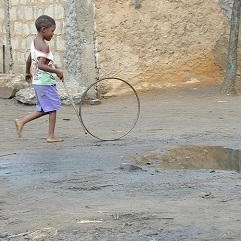 This Learning Paper by facilitators of the 4PCCD project explores the particular, participatory approaches taken in identifying climate-related development problems and solutions in Chamanculo C. Through the process, residents pinpointed the need to address sanitation issues as a key development priority – and it was found that addressing these concerns would also address their vulnerability to climate-related impacts. The authors of the paper are Vanesa Castán Broto, Bartlett Development Planning Unit, University College London, London, UK; Emily Boyd, University of Reading, Reading, UK; Jonathan Ensor, University of York, York, UK; Carlos Seventine, Fundo Nacional do Ambiente (FUNAB), Maputo, Mozambique; Domingos Augusto Macucule, Universidade Eduardo Mondlane, Maputo, Mozambique; and Charlotte Allen, Independent Consultant, UK. The team prepared the learning paper as part of a learning programme on subnational climate compatible development facilitated by CDKN and ICLEI-Local Governments for Sustainability.